His bottom lip slid out like a drawer and he shrugged and flapped his hand. I had hoped that the rumours of banditry were exaggerated; perhaps I was wrong. Still, I’d come, with my girlfriend Lara, to see what the south-eastern corner of Sicily was like when the summer tourist crowds had eased. Not having a car was not an option. I took a deep breath and signed. Nestled at the foot of Mount Etna, Catania is Sicily’s second city, but aside from an elegant piazza and duomo made from local slate-grey volcanic rock, it does not score highly on the Italian-city beauty scale. We walked past abandoned resort buildings and ugly car parks. Men in shell-suit tops sold chestnuts and potatoes from braziers as if we were in the depths of a Moscow snowstorm rather than a Mediterranean winter. While the locals were covered up, for easy-burning English like us the weather was perfect: clear blue skies and 21C. The next day, with the car reassuringly un-stolen, we went down the coast to Syracuse. This was much more like it. Syracuse is nearly 3,000 years old and during Ancient Greek times was one of the centres of the Mediterranean. The city was all but destroyed in 1693 by an earthquake that shook the bones of the whole island, but was rebuilt soon afterwards in glorious baroque style that remains mostly untouched. This is particularly the case on Ortigia, Syracuse’s old town set on a teardrop-shaped island connected to the mainland by a couple of road bridges. In the summer the place must sweat and heave: its tiny cobbled streets and perfect square are the kind that make postcard-sellers plan a new kitchen. After a couple of days of drinking negronis and looking at churches, we drove an hour west to Il Granaio, an agriturismo just outside Modica where vast plates of local fruit, ham, ricotta, eggs and bread were laid out for us each morning. There was serious eating to be done nearby too. When chocolate was discovered in the new world it was first brought back to Modica, where it was made cold so that the sugar did not melt. Northern Europeans later added heat and milk to the process but the old technique is still used here. Once you get over the initial graininess the chocolate has a rich, lingering flavour. I bought 10 bars from Antica Dolceria Bonajuto. Twenty minutes’ drive north west of Modica is baroque Ragusa Ibla. 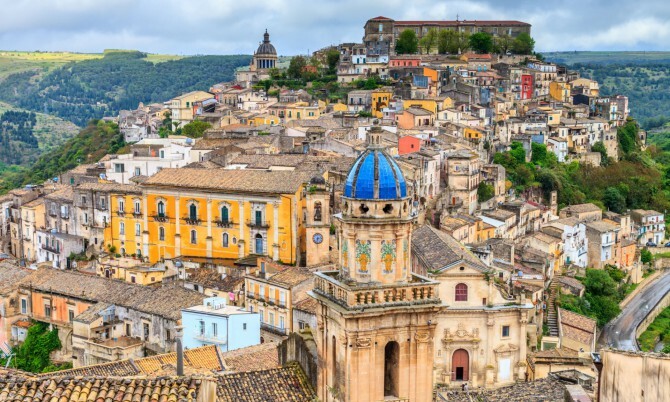 With few cars, stone streets and views over the hillside, the town looks like a film set and often serves as one – many scenes from the Inspector Montalbano series, Italy’s answer to Inspector Morse, were shot there. Down a side street behind the main church was a restaurant – called Duomo (cicciosultano.it) where we splashed out £35 each on a lunch of insouciant brilliance. An anchovy was presented with the skeleton fried to a crisp and perched on top of two fillets of silver flesh. Spaghetti with sardine had that thing that’s common to good seafood pasta (but somehow difficult to recreate in Finsbury Park) where each bit of pasta seems to be covered in a glossy sheath of umami. Then there was a hunk of mountain pork, purple and salty and rich as volcanic soil. Somewhere in the mix was a truffle ice-cream sandwich then a sweet creamy tube of canolo. At the next table I heard a couple compliment the manager and suggest the restaurant merited a visit from the Michelin boys. “Ah yes,” he replied. “We have two stars, in fact.” Two Michelin stars that they prefer not to talk about much. Our whole time was marked by memorable meals – we were surprised to find that most restaurants were open. Mountain soups slopping over with rich chunks of pork, islands of pizza with cracked black shorelines and bubbling mozzarella interiors. On the famous Sampieri beach we ate a €10 picnic of cheese, crimson tomatoes and salty fresh focaccia in our swimming costumes, while watching a local wearing waterproofs and a thick jumper drag in a shrimp pot. The endless campaign of road building in these parts meant that our satnav was often confused by new roundabouts or reversed one-way systems. Aside from that, this is a landscape that remains largely immune to modern Europe, the patchwork of olive trees, vines and rocky hills as it would have been when the area was part of the Carthaginian empire. Without tourists here there is just sleepy agriculture and a spattering of light industry; plenty to remind tired city-dwellers like us of the simpler pleasures, and make them fat.